Expand and replicate several popular and effective existing District schools, including School Without Walls, World of Inquiry and its expeditionary learning approach, School of the Arts, The Children’s School. Under “Future Concept Schools,” the plan advocates the creation of two magnet schools (one high school and one elementary school), each designed to draw students from both the city and suburbs. At least one suburban district and college, and other possible partners, have already been identified as potential collaborators in the development of the school concepts outlined in the plan. Many critical details would need to be worked out before these and related ideas can be implemented, but the fact that these concepts are part of the Path Forward plan is encouraging. 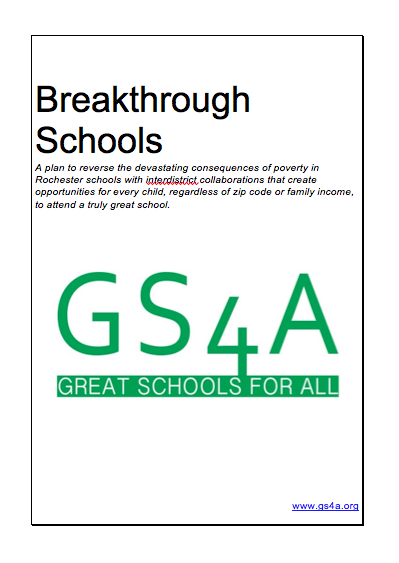 GS4A looks forward to working with the district and other potential partners in the development of these initiatives. Efforts to expand the numbers of teachers of color and to make the curriculum at all levels more culturally sensitive and relevant to students. 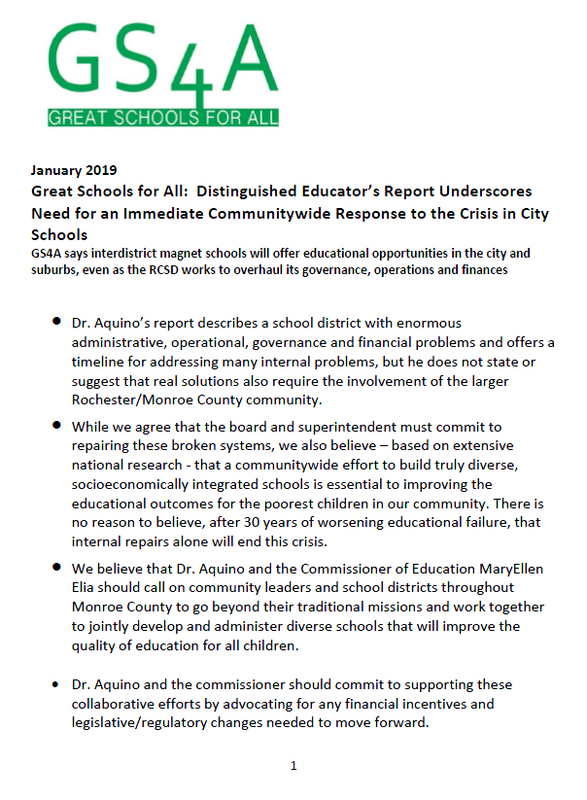 Great Schools for All looks forward to working with city and suburban school officials and all sectors of the community to help develop these ideas and support for their implementation. I recently sat in on a Rochester Board of Education committee meeting that focused on approaches to improve student outcomes, particularly graduation rates. You know the context: Despite board priorities and the efforts of a parade of superintendents over the past several years, the district has struggled to move four-year on-time graduation percentages above the mid- to upper-40s. Ongoing approaches and promising new and modified initiatives were discussed at this meeting. The back and forth between board and staff reflected a sense of, “this time it will be different,” that these efforts and the dedication of board members, administration, teachers and principals, parents and students will combine to move the needle toward significantly improved student achievement and graduation rates. I’m a believer in “the promised land,” and the potential of numerous encouraging initiatives throughout the district, under goals set by the board and being carried out under the promising leadership of new superintendent Barbara Deane-Williams. And yet…and yet, concentrated poverty levels remain high, and no school in the district has a poverty population below 60 percent. 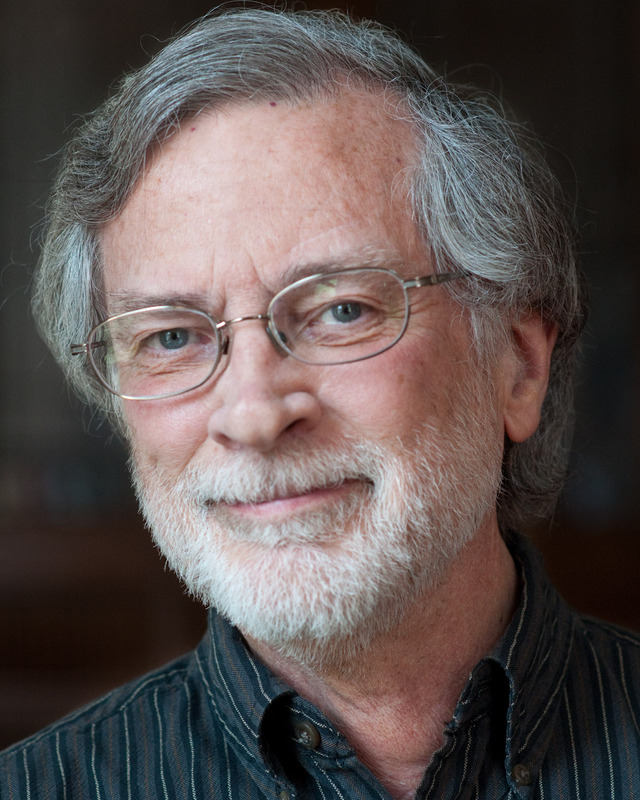 Our local history—reinforced by consistent research findings across school districts throughout the country—strongly suggest that there are limits to what any of these internal promising initiatives can do to overcome the insidious effects of concentrated poverty, unless accompanied by other systemic interventions. Great Schools for All strongly supports the district’s laser-sharp focus on a variety of actions to strengthen internal standards, structure and operations; to strengthen individual schools; and to improve achievement levels and academic and support programs for children. But GS4A also believes that this is a “Yes…And Also” proposition: That it is also important to simultaneously develop community-wide plans, shaped by all the existing research, to launch a network of socioeconomically diverse cross-district schools that are most likely to result in dramatic improvements in student achievement and graduation rates for the poorest children in our community. While efforts of the district, and of the Rochester-Monroe Anti-Poverty Initiative (RMAPI), focus appropriately on ways to strengthen supports in individual schools and neighborhoods, national research makes clear that these important efforts will be enhanced and that the ultimate goal of “lifting children out of poverty” will be more rapidly attained if the concentration of poverty in individual schools can be minimized. While, of course, there will always be individual kids who defy the odds, overcome the effects of poverty, and excel, research demonstrates that diverse schools can improve the odds for the majority of city children who, through no fault of their own, are being taught in schools with high concentrations of poverty. Cross-district, socioeconomically diverse magnet schools have demonstrated their success in numerous communities across the nation. Not only do they improve the performance and graduation rates of poor students, they also improve critical thinking and problem-solving skills for all students, poor and more affluent/middle class students alike. Voluntary magnet schools can offer cutting-edge academic opportunities that not even the most affluent school districts can afford to offer on their own, and in so doing draw students from both urban and suburban school districts. Local parent survey data, and the experience of other communities across the country, indicate that there is strong support for such opportunities. Several encouraging developments are under way locally that could lead to such schools in Monroe County. GS4A is having constructive conversations with leadership in the City School District and with leadership in several suburban districts to explore these possibilities. Discussions are in very early stages, but offer the potential to create diverse educational opportunities to benefit students throughout Monroe County. Simultaneously, GS4A’s Magnet Schools Committee has developed a process that will soon seek proposals from parties interested in collaborating with school districts or other community partners in the development of one or more socioeconomically diverse magnet schools. Related plans are also being finalized for a series of community gatherings designed to bring together interested parties from various sectors throughout the county to develop ideas for diverse cross-district magnet schools that would respond to student and parental needs and desires by offering opportunities not currently available in any school district. We say Yes to RCSD and RMAPI efforts to strengthen existing schools and neighborhoods, but lasting change must also include collaborative efforts across districts that will improve outcomes for students living in poverty, sharpen the cultural competencies of all students and strengthen the workforce of the future. What can Dallas teach Rochester about voluntary socioeconomically diverse schools? The Rochester/Monroe County community has something to learn from conservative Dallas? The same Dallas which has recently experienced tragic race-related killings? The same Dallas that is overwhelmingly segregated by race and income? The same Dallas in which public schools have largely been deserted by middle class families, leaving behind public schools about 85 percent of which have student enrollments of at least 80 percent low-income children? The answer appears to be: Yes we do. And this is especially important because of the disturbing similarities between Rochester and Dallas: Like it or not, we recognize our own high degree of racial and economic segregation between our city and suburban areas, and the high concentration of poverty that impacts all of our city schools. So what does this have to do with what we can learn from Dallas about school diversity and voluntary integration of schools? Seemingly quite a bit. But first, some brief local context. Readers will recall that a recent survey of 600 parents of school-age children, evenly-divided between Rochester and suburbs, found compelling evidence that large majorities of both city and suburban parents would consider socioeconomically-diverse magnet school options for their children, even if it means crossing school district lines, as long as those schools provide academic and cultural opportunities not available in their home districts. But even though the findings suggest strongly that attitudes and behaviors are changing among today’s generation of parents across our community, and that there is a substantial degree of support for diverse schools, survey responses are not necessarily predictive of actual decisions. Enter Dallas. Now we have new evidence that connects the dots between what parents here say, and what parents in Dallas are actually doing. Recent experience there suggests that significant numbers of parents are not only saying they would consider diversity in their decisions about schools, but are specifically making that an integral factor in their actual decision. To read more, click here. Mike Koprowski, the Dallas school district’s chief of transformation and innovation, says “we cannot deny that high-poverty environments create significant learning challenges, and diverse schools consistently prove to be dramatically better learning environments for all students, both middle-class and low-income alike.” Accordingly, in this new school year, Dallas has launched what we would consider a voluntary magnet school, Solar Preparatory School for Girls, a K-8 STEAM (science, technology, engineering, arts and math) school that, “for the first time in district history,” uses socioeconomic diversity as the primary criterion in admissions decisions. Fifty percent of the seats in the school are reserved for low-income students (based on free- and reduced-price lunch designation) and the other half for students who do not qualify and are considered middle-class students. As in this community, there were skeptics who said, “Wealthier families wouldn’t risk enrolling their child in a school that’s half poor,” and that Dallas was not ready, given its troubled history and recent past. But in fact, the reality is that the school is oversubscribed, as “applications poured in from all corners” of both the poor and wealthy sectors of the community. The district received 360 applications for 198 seats, far surpassing district expectations, with waiting lists from both low-income and middle-class families. Of course the ultimate test is yet to come, as student success, skills and cross-cultural understanding are measured in the coming months and years, but Dallas officials are encouraged that, “Many families are seeking diverse learning environments for their children and won’t succumb to false fears about people from different backgrounds,” and that “Dallas is poised to contribute to an overdue but critical national dialogue” about the intersection of race and class and diverse schools offering new opportunities not previously available to their students. We now know that a critical mass of parents in Rochester and its surrounding suburbs have expressed readiness for such diverse options for their children. A number of specific ideas for cross-district, socioeconomically-diverse magnet schools are in various stages of discussion and development—including schools focusing on themes and curricula as diverse as a military academy, a river/waterways school, photonics, and health-sciences, among others. Various school district superintendents, colleges and universities, and other potential providers are beginning to come together to flesh out ways the GS4A principles for diverse specialty schools can be made reality. We now need YOU. We are urging parents, teachers, school administrators and others who are interested in supplementing these ideas and helping develop additional new school options to sign on. We are in the process of establishing groups to help flesh out the principles and framework underlying magnet Breakthrough Schools, to begin to shape ideas for specific Breakthrough Schools of the future, and to make sure the perspectives of all affected parties are included in our deliberations. And we are also interested in finding ways to incorporate student perspectives. This is the time for broad GS4A principles to be converted into action steps. YOU and your input are needed and encouraged. Click on the Contact link at the top of this page to indicate your interest. In a blog I wrote in April, I explored whether there was a positive response to doubters who may like the concept of diverse public magnet schools, but who wonder who’s going to develop such schools and who if they would attract socioeconomically-diverse students across district lines. The conclusion was Yes—a number of such opportunities are either already in place or are in various stages of active conceptualization or development. Now we have powerful evidence that “if you create it, they will come.” A countywide survey of parents of school-age children demonstrates keen interest among parents—across geographic, income, racial and ethnic lines—in considering socioeconomically-integrated magnet schools that would draw students across school district lines to access specialized academic offerings that even the most affluent districts cannot afford to offer on their own. The survey is posted elsewhere on this GS4A website. The survey was conducted by Metrix Matrix, a respected local survey research firm, with the costs underwritten with the generous support of the Max and Marian Farash Charitable Foundation. GS4A is grateful to both organizations for making this important survey possible. Metrix Matrix completed telephone interviews with 602 parents of school-age children, 301 from the city and 301 from the suburbs. The survey results were weighted to reflect the distribution of households with children across the county. The survey findings reflect a representative sample of the county and city population in terms of economic and racial/ethnic makeup. • Almost 90 percent of the parents indicated that they would consider enrolling a child in one or more of 7 potential magnet school options identified in the survey. Most of those selected three or more magnet options of interest. • About 70 percent would consider magnet options with a mix of 50 percent low-income and 50 percent middle-class students. Research over the past 50 years has consistently demonstrated that such a mixture of students from different socioeconomic backgrounds contributes to improved outcomes for both poor and middle-class students, both in terms of academic achievement, graduation rates and critical thinking skills, creativity and the ability to learn to collaborate together. • Almost two-thirds of all parents would be willing to have their child transported to a magnet school if it were no more than 30 minutes from their home. • Furthermore, three-quarters of all parents indicated that they would consider sending their child to a magnet school on a voluntary basis, even if it were outside their home district, if transportation needs were met and it provided opportunities not available in their home district. So, what’s the takeaway from all this? As we have discussed our ideas throughout the community we have heard considerable support for the concept of diverse magnet schools, but also skepticism about how much interest there would be from parents in having their children attend diverse magnet schools. This survey shows clearly that, although generally satisfied with their current educational offerings, parents overwhelmingly say that they want a richly diverse educational environment for their children and that they do not want to limit their children to the programs available in their home districts if better alternatives exist elsewhere in the community. Of course what people say on a survey does not necessarily predict what they would do in real life. But the evidence is so strong and compelling from the survey that it is hard to ignore: that there is a large critical mass of parents throughout urban and suburban segments of the county who value the opportunity to provide their children with academic options not currently available to them, and to expose their children to the types of cultural diversity that will characterize the increasingly-diverse society and workforce of the future. The results challenge the skeptics who have long said parents would reject even voluntary integration across district lines. Indeed, the results suggest strongly that significant numbers of parents of today’s school-age children support the concept of more diverse schools, even if it means crossing school district lines, and even more specifically want their own children to at least have the opportunity to consider options created by such specialized, diverse schools. For additional discussion of the implications of the survey findings, and to hear more about specific magnet options in various stages of consideration and development, please plan to join GS4A in a community event open to everyone, on Thursday, June 9 at 7pm at Third Presbyterian Church at the corner of East Avenue and Meigs Street. We hope to see you there. One of the concerns Great Schools for All advocates hear consistently is something along the following lines: Nice idea, but who’s going to develop public magnet schools that offer unique specialized academic opportunities that will attract socioeconomically diverse students from across school district lines? Well, it turns out that a number of such opportunities are either in place or in various stages of active development. Several magnet programs already exist within the Rochester City School District and are in the process of opening their doors to interested suburban students. RCSD is developing other partnerships with one or more suburban districts. In addition, several potential magnet school operators are in various stages of developing proposals for interdistrict schools. Let’s take a brief look at some of these existing and emerging options. Existing districtwide Suburban-Urban programs within RCSD:The city school district is actively recruiting suburban students to magnet schools heretofore only open to city students. It has a formal application form available on the district website for students interested in exploring one or more of the following schools, as part of the district’s new Suburban-Urban Transfer Program. By actively soliciting students from all suburban districts, the program is intentionally designed to be the reverse-direction counterpart of the longstanding Urban-Suburban Transfer program, with its historic flow of students from the city to participating suburban districts. Edison Tech (Edison Career and Technology High School) has been reconfigured to provide rigorous academic and technical coursework and work-based learning opportunities, and the opportunity to earn college credits while in high school. It is designed to be a positive force in the regional economy by offering the opportunity to develop skills and experience in areas such as Construction, Architecture and Design; Advanced Manufacturing and Engineering; Digital Media and Communications; and P-TECH (described in more detail below). East High School is a collaborative effort of the city school district in partnership with the Warner School of Education at the University of Rochester. The UR in effect is acting as the superintendent overseeing the lower school (grades 6-8) and the upper school (grades 9-12) programs at East. The programs offer an extended school day and increased instructional time, along with several targeted career pathway programs developed with input from college and industry partners and offering practical experience as part of the learning process—including culinary arts, information technology, medical careers, precision optics, teaching and learning institute, and vision care. Wilson Magnet International Baccalaureate Program offers an internationally-recognized and accredited program for high school students. The program emphasizes critical thinking and analysis, the development of research skills, connections between traditional subjects and real-world challenges, and community service. Students are able to earn up to a full year of college credit while in high school, and students with an IB diploma who are accepted at the University of Rochester receive a full-year scholarship for four years. The Leadership Academy for Young Men is focused on creating academic, business and leadership opportunities for its all-male student body. The program emphasizes personal integrity, discipline, accountability and mutual respect. It operates in partnership with the UR to provide leadership and mentorship opportunities, and with the Junior Reserve Officer Training Corps (Junior ROTC) to develop character, discipline, leadership and academic success. The program is available to male students in grades 7 through 12. Developing partnerships between RCSD and other school districts: Three emerging programs are being developed as pilots by theRCSD in conjunction with other districts, using funding available through a federal socioeconomic diversity grant. The programs being developed this year are designed to create academic opportunities for both city and suburban students that would not otherwise exist except for the cross-district offerings. P-TECH Rochester is a “grade 9-14” academic and career program that integrates the best elements of high school, college and the professional world. The program is accepting applications from students from any suburban district. Students will focus primarily on science, math and technology, participate in extended day and summer programs, take courses at both Edison Tech and Monroe Community College, and be exposed to mentors and internships at major companies in the Rochester region. P-TECH students will earn both a State Regents diploma and a two-year Associates Degree from MCC, without paying any college tuition. School 50 and West Irondequoit Pre-Kindergarten Collaborative is designed to pilot an inter-district socioeconomic exchange program building on the Universal Pre-Kindergarten program at School 50 in the city. Five of the slots in that program will be dedicated to students from the West Irondequoit district in the first year beginning this fall. Those students in turn would be guaranteed spots in School 50’s Kindergarten program in the 2017-18 school year. Parents at School 50 are being asked to partner with the families of the new WI students to aid in the transition. The pilot program has the potential to be a building block for expansion in the future. School 12 and Brighton Dual Language and Enrichment Program is initially focusing on shared enrichment activities between School 12 and the French Road Elementary School. School 12 features the HOLA program, a dual-language enrichment program providing instruction in both English and Spanish. Ultimately this unique program is expected to attract middle class families from the surrounding neighborhood in the city as well as students from Brighton. The initial year will focus on developing relationships, understandings and exchange activities between students in the two schools, with enrollment of suburban students expected beginning the following year. Magnet schools in development by other providers: A number of other providers outside of school districts are considering the creation of magnet schools that are not currently available in any single school district. Such providers include local colleges and independent operators considering various types of specialized academic offerings, locations and partnerships. For understandable reasons, it would be premature to say more at this point, as plans are in the early stages of development, but they appear promising. More details will be provided as they become more fully developed. So to those who suggest that interdistrict magnet schools are pie in the sky and will never be developed, the emerging evidence suggests that several already are well along the road to being created and even in place, some with student recruitment actively underway. Stay tuned for further developments as these initial building blocks of a potential system of magnet schools evolve. Is There a Market for Interdistrict Magnet Schools? • Will anyone be interested in interdistrict socioeconomically-mixed magnet schools? • Would any students want to attend? • Would any parents send their kids outside their home districts to attend a theme-focused magnet school? • Is it possible to generate the critical mass of urban and suburban students needed to justify investments in these schools, strategically situated in the city and suburbs? And in response, skeptics say: No. Not likely. Probably not. Interesting idea, but unlikely to happen. Others, however, say: Hold on. Not so fast. Let’s not jump to such negative conclusions when we don’t even know the details of what such schools might look like. Let’s reserve judgment until we have specific proposals to consider. In that context, I’ve been struck recently by several developments and observations suggesting that there may well be a potential market just waiting for interdistrict magnet schools that would appeal to interests and values now beginning to surface throughout our community. A small group of students representing city and suburban schools have been meeting occasionally under the guidance of teachers to discuss breaking down barriers between city and suburban schools. A group of city students regularly discusses ways to change the educational system, including crossing existing district boundaries. A class of students at a local private school has been discussing ways to advocate for changes that would have the potential to bring more students together across racial, socioeconomic and geographic lines. Talk is cheap, and none of this proves a willingness to actually cross district lines to attend magnet schools, but it does suggest that many young people share the values and value the outcomes that this GS4A initiative is designed to address, and may be amenable to having the conversation, when more concrete options are proposed. And what about the adults? Over the past couple of months, GS4A has conducted several focus groups of parents and guardians of students about evenly split between city and suburbs. Asked about pulling their kids out of existing schools to cross district lines to attend more economically diverse schools, initial reactions were to stay put. But when specific examples of potential diverse magnet schools were raised for consideration—types of schools their children would not now have available to them—the conversations typically changed, and levels of interest perked up. Asked if they would be willing to consider having their children cross district lines to access such schools, many said yes, they would be open to the possibility. Asked how much of a barrier transportation might be to such decisions, most said that their kids were already spending considerable time on buses in both city and suburbs, so that by itself would not constitute a knockout factor in their decisions. And, of course, some city parents have already opted to send their kids outside district lines to access schools in the Urban-Suburban program. So again, at this point this is all just talk, but it certainly does not suggest the automatic “No way” response we have received from some stakeholders. Even district superintendents with whom we’ve met have acknowledged that they have students who may well be interested in attending such schools if they provide academic opportunities unavailable in their own districts. And beyond local speculation about what might happen here, there are examples in communities across the country where significant numbers of students have made conscious choices to cross urban and suburban lines to attend socioeconomically-diverse magnet schools that offer academic options not otherwise available to them in their neighborhoods or home districts: including more than 20,000 in Raleigh/Wake County, NC, and many others in places like Omaha, Minneapolis/St. Paul, Hartford, Montgomery County, MD and other communities where students and their families have made such choices. So let’s not be so quick to assume that there would be insufficient interest in supporting a network of diverse magnet schools as a way of reducing the effects of poverty, and better preparing both urban and suburban students for their future and the future well-being of our community. To further test this proposition, we’ll be conducting a professional survey of several hundred urban and suburban parents later this winter to more formally gauge the level of support for particular types of interdistrict magnet schools. I attended all three of the recent GS4A town hall meetings in city and suburban locations, and was struck by the strong support for increasing socioeconomic and racial diversity in our schools, and the practical and societal impacts that can result from such initiatives. I was also struck by the need to clarify our message and broaden our constituency. Some seem to believe that Great Schools for All’s central message is simply to strengthen the Urban-Suburban program. Some suggest that we are primarily about deconcentrating poverty and dispersing it, rather than focusing on reducing it. Others imply that we are not supportive of efforts to strengthen city neighborhood schools. And others think there is little in our proposals that applies directly to suburban students. To all of the above, we say, Not True. Or only partially true. From the beginning, the volunteer-driven GS4A initiative has attempted to make it clear that no one solution or approach will solve the issue of underperforming urban schools. We believe multiple approaches will be needed, and that all segments of the community will need to be engaged, offering a variety of solutions. GS4A has focused our efforts on promoting systemic changes that would involve creation of targeted-focus magnet schools that would draw students on a voluntary basis from across urban and suburban school district lines, as well as a variety of other shared learning partnerships between combinations of schools. Such cross-district collaborative partnership schools, as has been demonstrated in communities throughout the country, offer urban and suburban students alike specialized opportunities to learn in unique schools that are responsive to diverse student needs and interests that even the most affluent districts could not afford to offer on their own. But we recognize that not all students will be interested in crossing district lines. Most suburban students will choose to remain in their home districts. And many urban students will choose to remain in city public schools. But we believe that there will be a critical mass of interested students from both city and suburbs who will choose to seek out magnet opportunities, once these options are fleshed out and they realize how beneficial such programs can be, both for the individuals involved and for the long-term economic benefit of a better-educated, diverse future workforce. And in the meantime, what happens to those students who will choose to remain in neighborhood-based city schools? We embrace and strongly support efforts to strengthen those schools, including efforts to promote the Beacon schools concept of strengthening both school resources and academic offerings, and the development of strong family support services linked to the schools and their surrounding neighborhoods. We also support the efforts to create new and strengthened academic models in the City School District’s state-designated poor-performing “receivership schools.” Efforts to reimagine and strengthen these schools can, we believe, improve academic performance, rejuvenate surrounding neighborhoods, and potentially create magnet models that not only strengthen the core neighborhood schools, but also draw a socioeconomically-diverse array of students to help mitigate the impacts of the concentration of poverty in some of those schools, as has happened in cities like Raleigh, Hartford, Omaha and other communities. Strengthening neighborhood schools in the city is viewed, appropriately, by many city leaders and parents as a critical strategy in reducing poverty and its impact in the city. We agree. This must happen. But we are also mindful of the overwhelming evidence from research over the past 50 years that makes it clear that—no matter how much we do to strengthen neighborhood schools—if they remain schools where the majority of students live in poverty, not all, but most students in those schools will continue to fail to meet academic standards and the demands of the work force of the future. So yes, we must tackle poverty by creating stronger neighborhood schools and the support services around them. But we should simultaneously craft long-term systemic solutions, such as evidence-based magnet schools and cross-district collaborative programs that help lift students out of poverty by improving their educational outcomes. The Rochester-Monroe Anti-Poverty Initiative provides an opportunity to address the critical role education can play in reducing poverty in our community. The Initiative’s initial report has lifted up the importance of increased socioeconomic diversity in strengthening the academic performance of high-poverty students, without any negative impacts on the performance of more affluent students. The development of specific anti-poverty strategies in the coming months provides an opportunity to come together as a community of concerned city and suburban leaders and parents to develop both place-based/neighborhood-focused and systemic community-wide solutions to strengthen education outcomes that will benefit the entire Rochester and Monroe County community. GS4A believes that we basically all want, and care deeply about creating, better opportunities and futures for our kids. We may have different thoughts about how we get to this goal, but if we’re starting with the same hoped-for destination, we should be able to find the common ground that enables us to move forward together, using multiple approaches to help us get there: various strategies and approaches that complement and build on each other. GS4A would love to help facilitate bringing together city and suburban adults and students interested in having an honest discussion about where we differ, but where we can also find the commonalities in efforts to strengthen our schools, so that we can be allies and mutually supportive where possible, modify or clarify approaches as needed, and find ways to mobilize resources toward common purposes. Let us know if you’re interested. Research and success stories from across the country make it clear that de-concentrating poverty and increasing socioeconomic diversity in schools significantly improve academic outcomes for poor students, without adversely impacting the performance of those who are more affluent. And while poverty is most concentrated in Rochester schools, many suburban districts also face growing rates of poverty in their classrooms. So we must engage both city and suburbs in finding a variety of ways for the good of our entire community to get to what Beth Laidlaw referred to last week as the Yes Zone. broadening the Urban-Suburban program to expand movement of students from suburban to city schools in addition to the current city-to-suburban transfers. But as we think about systemic change to foster diversity for as many students as possible, we must also be aware of those not included in magnets, or charter school options, or the Urban-Suburban program. We must be very careful not to inadvertently drain more students and resources from the city, leaving those students whose families did not voluntarily choose an alternative program concentrated in schools that are even poorer and more racially isolated than city schools are today. Frankly, this has been a problem in the past with the one-way Urban-Suburban program, and it’s a problem with many of our charter schools, which are often just as segregated as other city public schools. While these programs have offered attractive options for many city families, they have often attracted many of the brightest and most motivated kids and families, leaving greater concentrations of behavioral problems and economic and racial isolation behind. So in our work to create expanded options and more socio-economically integrated schools, we have to be mindful not to inadvertently make things even worse for those not included. So, what might all this mean and look like in the future? First, it means not just transferring city students to suburban schools. As leaders of the Urban-Suburban program recognize, it needs to be a suburban-to-urban program as well, to create greater economic and racial balance. And for that to happen, there must be strong magnet schools in the city that offer options that suburban kids will want to be part of. Such programs exist, and with replication or expansion of available slots, we have received strong indications that numbers of suburban students would be interested in attending city schools such as P-Tech at Edison, School of the Arts, School Without Walls, Montessori, World of Inquiry expeditionary learning, and the International Baccalaureate program at Wilson Magnet School. Expanding opportunities for new suburban students while maintaining existing slots currently filled by city students would increase diversity in the schools and reduce the concentration of poverty. GS4A wants to work with the City School District to help strengthen and promote these programs so they are better options for both city and suburban students. City magnet schools could be supplemented by others developed on campuses or in other school districts. These magnets would draw students from any district because they would provide special-focus opportunities that could not cost-effectively be offered by individual districts. Raleigh, Omaha, Minneapolis and other regions have proven the value of such schools in attracting diverse student bodies and strengthening academic opportunities and outcomes across city and suburban boundaries. An array of magnet schools offers great potential but also the likelihood that many neighborhood schools will remain segregated, at least initially. We must make better use in the meantime of resources to strengthen promising but struggling neighborhood schools. Highlighting the urgency, some 15 of those schools are currently on the state list of “receivership schools” targeted for special attention over the next couple years. GS4A has consistently said multiple solutions will be needed to counter the effects of concentrated poverty. So while we continue to focus on systemic changes, we also support those working to strengthen neighborhood schools, through the receivership process and in other ways, so that better schools will be available for those who choose to remain in schools where they are. We hope these schools will evolve as strong neighborhood schools, perhaps developing strengths that could over time make some of them magnets for city and suburban middle class students, to help further strengthen both diversity and neighborhood-based schools. There is no one single approach to addressing poverty concentrations in our schools, as we must look for both broad community-wide systems change and stronger in-place neighborhood schools, rather than seeing one or the other as THE solution. Together, we must find varied pathways that can contribute to reducing the effects of concentration of poverty as part of this community’s array of anti-poverty solutions. If Great Schools for All had a mantra, it would be WIN-WIN. We don’t have to accept as inevitable huge gaps between winners and losers, where students’ success or failure is pegged to their zip codes and family income. In a WIN-WIN environment, our community would rally around educational reforms and systemic changes that would reduce these disparities. That’s what GS4A is all about. All children are capable of learning and succeeding academically, regardless of where they live, and we’re all aware of examples of bright, motivated kids who have risen up from impoverished backgrounds to succeed, despite the odds. But we also know, from decades of research, that the deck is stacked against students in high-poverty schools. When the poverty population of a school tips past 50 percent, the odds of success are statistically much lower. And every school in Rochester far exceeds the tipping point, with predictable academic consequences in most. So why is our community willing to accept this situation? The city has many successful students, and a number of successful, popular schools. But what if we could find ways to strengthen those schools, retaining current students, but expanding the socio-economic diversity in each? What if we could open more slots in these schools and offer them to more affluent students, to create a more diverse student body? Or replicate the most successful schools based on the initial models? We could create a WIN-WIN situation by offering, on a voluntary basis, well-regarded city programs such as School of the Arts, School Without Walls, Montessori, World of Inquiry expeditionary learning, and the International Baccalaureate program at Wilson Magnet School to students who have few or no such options even in well-off suburban districts . And what if we were to create additional voluntary magnet schools across the county, based on models that have proven successful in other urban communities, offering opportunities that would not be available within most individual school districts, and that would be so exciting and unique that both urban and suburban students would want to attend? The research makes clear that poor children perform much better in schools that are economically mixed than they do in high-poverty schools. And their success does not come at the expense of the middle class students in those schools. As one example, in Raleigh/Wake County, N.C., where 35 economically-diverse magnet schools have been created, subject to policies capping proportions of low-income students at roughly 45 percent per school, graduation rates for low-income and racial-minority students have steadily increased in recent years to more than 70 percent — some 30 percentage points higher than for comparable students in the more economically segregated Rochester schools. Meanwhile, the more affluent Raleigh suburban student graduation rates have increased slightly during those same years to more than 90 percent—rates comparable to Monroe County suburban rates. Disparities in rates have not been eliminated, but have been significantly reduced in Raleigh. What is not to like about such a situation, and how would that not represent a WIN-WIN for all in Monroe County if we could move in such a direction? In addition to enhancing academic performance, creation of more voluntary diverse learning environments would also expand cross-cultural understanding among all groups of students, and better prepare them—urban and suburban, black, Hispanic and white, well-off and poor—for the far more demographically diverse workforce that awaits them in the future. Students would have more academic choices than could now be provided by most individual school districts, and the economic vitality of our community would be enhanced by a larger pool of better-educated workers to populate our future work force. Under more diverse voluntary-choice school scenarios, there is an immense upside potential for our community, with no obvious losers. Clearly the details of how this happens will be critical, but why would we not embark on this journey to explore a variety of possible solutions to reduce our odds of failure and significantly increase the odds of WIN-WIN outcomes for our community? All of this is a work in progress. GS4A intends to talk with school district officials and survey parents and community leaders across the county concerning these issues over the coming weeks before any proposals are finalized. Anyone interested in joining the process, please email at contact@gs4a.org. That was then, more than a generation ago, with significant concerns being raised about the effects of “bright flight” among both white and non-white students and the declining middle class enrollment in Rochester city schools. This is now, and now is so much worse, with time running out to turn things around in our community. “Then” was 1979. 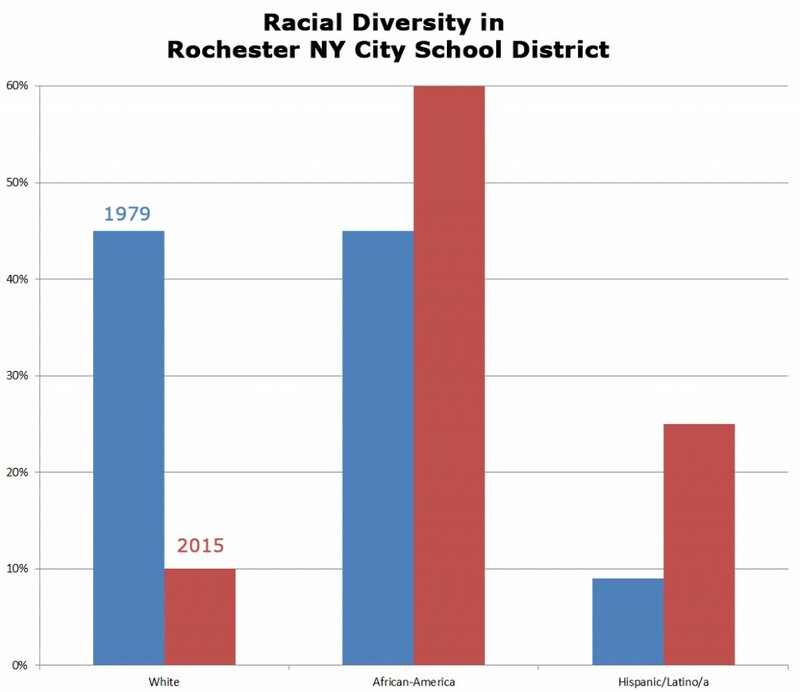 I recently reconnected with a Center for Governmental Research report published that year, Race and Education in Rochester, written in conjunction with a broad-based Citizens’ Advisory Committee concerned about the emptying out of city schools. The focus of that report was on racial diversity and integration, with no reference to socio-economic diversity and the effects of the concentration of poverty, which frames so much of today’s discussions about urban education. Nonetheless, the parallels and connections between the issues raised in that report and the realities of now are unmistakable. Meanwhile, child poverty rates in the city have doubled during these years, and State Education Department reports indicate that 90 percent of all RCSD students now are classified as economically disadvantaged/low-income. In the 1979 report, concerns were raised about increasing racial segregation and isolation in our city schools: At one end of the spectrum, the student population in 13 of 58 schools at that time was at least 80 percent minority, including 10 schools that were 90 percent or more minority; while at the other end, 14 schools had at least 75 percent white enrollment, including two exceeding 90 percent. The minority populations in the other 31 schools ranged between 26 percent and 76 percent. In retrospect, compared to 2015, the district in 1979 was relatively integrated. Today, all but five city schools have minority populations of at least 80 percent. Socioeconomically, only three city schools today student populations that are less than 80 percent poor, and even in those three “best” schools, around 2/3 of the students live in poverty. Why does this matter? Because national research demonstrates clearly that once concentrations of poverty in schools get much higher than 40 percent of enrollment, overall achievement levels decline. And every single one of our city schools now significantly exceeds that 40 percent mark! This doesn’t mean that individual students can’t succeed in such settings (we all know of dramatic success stories in spite of such concentrations), but the percentage of successful students will be much lower in high-poverty schools than in lower-poverty schools. And this is important, not just for the poorest students, but also for the more affluent, because socioeconomic integration leads to cross-cultural learning and diversity better prepares students for the work force of the future. If that was true more than a generation ago, with far less concentrated poverty than today, how much more true is it today? The future of another generation of students, and the future well-being of our community, are at stake.